A man has just days to find a co-driver willing to take part in a charity rally which will take them a third of the way around the world in an old Fiat Panda. Colin White from Paignton, Devon, plans to drive from London to Mongolia on the Mongol Rally, but is facing a crisis after his co-driver had to pull out. 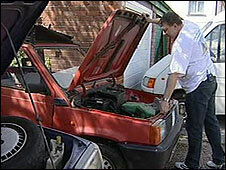 The car, which is worth less than £100, will have to cover challenging terrain on its journey to Ulaan Baatar in July. A new co-driver must be found by next week to ensure a visa can be obtained. Mr White said he was hoping to find a co-driver who could take about a month off work, enjoyed the outdoors, and was well travelled. He said someone who could speak a foreign language would be a bonus. "Preferably Russian - that would be great because I'm learning Cyrillic, which is really difficult," Mr White told BBC News. He expects the journey to take about three weeks - although he is allowing four for "almost certain" breakdowns. The route crosses five mountain ranges, two deserts and, according to the official website, has "more barren and inhospitable lands than you care to shake a gear-stick at". There are about 200 teams taking part in the rally. If Mr White can find his co-driver in time, he hopes to raise more than £2,000 for charity. Half the money will go to one of the official UK charities in Mongolia, while the remainder of the funds would be donated to a local Devon charity.